Antonin Scalia, the man most likely to be our next Chief Justice of the Supreme Court, turned history on its head recently when he attended an Orthodox synagogue in New York and claimed that the Founders intended for their Christianity to play a part in government. 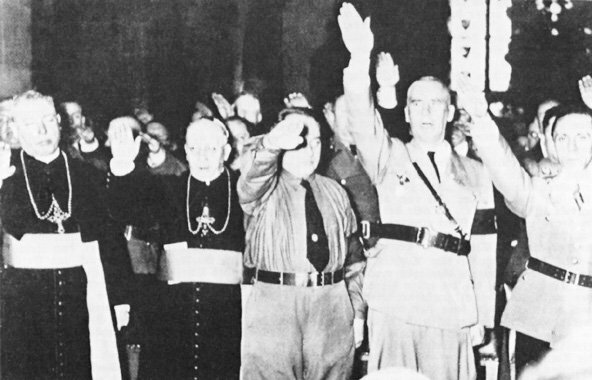 Scalia then went so far as to suggest that the reason Hitler was able to initiate the Holocaust was because of German separation of church and state. The Associated Press reported on November 23, 2004, "In the synagogue that is home to America's oldest Jewish congregation, he [Scalia] noted that in Europe, religion-neutral leaders almost never publicly use the word 'God.'" "Did it turn out that," Scalia asked rhetorically, "by reason of the separation of church and state, the Jews were safer in Europe than they were in the United States of America?" He then answered himself, saying, "I don't think so." The article, by Thom Hartmann, goes on to provide some useful history of church and state in Germany and the USA. Published on December 8, 2004 12:16 PM. previous entry: Coen / Xmas ?